The origins of Scandinavian ships and seamanship go back many centuries. Transport by sea was by far the easiest and in some places, the only possible method of moving goods and people. In the case of Sweden, travel over land through vast tracts of forest was slow and laborious. Almost all settlements were on the coasts, by the lakes or on islands. In Norway the sea gave access to the communities up its deeply indented coastline. Denmark was mainly a patchwork of islands which could only be reached by water. 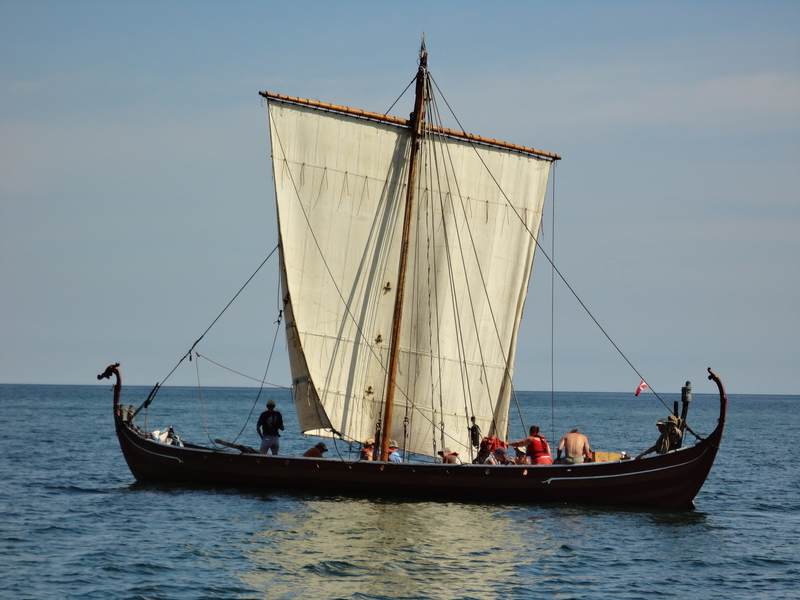 A reconstruction of Skulelev 2, the Sea Stallion, was sailed to Ireland where it was originally built by Viking shipwrights. The replica of Skuldelev 2 was launched in 2004. It was the records of the builders of this ship which led me to believe that the scale of the Viking ship-building industry has, to my knowledge, never been properly recognised. It must have been very far removed from the image of a cottage industry which is often portrayed by history books. The modern ship-builders at Roskilde who made the replica were experienced shipwrights and yet it took 10,000 hours to build the basic ship. It has been calculated from this that it would have taken a team of a master ship- builder and ten shipwrights, ten months to build the craft. But this is the minor part of the story. It took 14,000 hours to shape, trim and transport the 150 cubic metres of timber required for the construction. In addition, starting from basics; 400 kg of iron had to be produced for the 7,000 nails; 18 cubic metres of pinewood tar was needed to seal the hull; 2,000 metres of handmade rope was required for the rigging and 120 square metres of cloth for the sail. This was for one warship, albeit a big one. When one considers that fleets of around ninety ships set out on some Viking raids, and indeed it is said that at the Battle of Stamford, the Norwegian King Harald Hardrada had three hundred ships to transport fifteen thousand troops, it is clear that the ship building industry must have been huge. It must have employed an army of slaves to produce the raw materials and a considerable number of skilled craftsmen. So where were the ships built? Clearly, logistics dictated that in a country where transport over land is difficult, ships would be built on a waterside site which is as close as possible to the sources of the raw materials needed in construction. In my book I have chosen Sigtuna, in Sweden, as a site for a ship yard. There are several reasons for this. Firstly, there was the administrative infrastructure to organise construction on a large scale. Secondly, there was good access to the timber needed for charcoal production and shipbuilding. Thirdly, there was a supply of iron ore not far away to the west. And finally, there was a demand for ships. King Erik had given his dead brother’s son, Styrbjorn, a fleet of ninety ships to persuade him to relinquish his claim to the throne. In order for Erik to maintain and extend his control over the country he needed to replace these ships. This would have required a mammoth ship building programme. Reproduction tools, based on discoveries by archaeologists, were used the building of the replica ships. The Viking sailors themselves had the benefit of theaccumulated experience and knowledge of generations of seafarers. It is often debated whether they had any instruments to help them on their voyages. In my book I describe an implement which, it is said, was used to find the direction of the sun through fog. There is, however, no doubt that the Viking sailors relied mainly on natural phenomena to navigate. They used the sun and the Pole star, but also cloud formations, wave patterns and the presence of sea birds. While the Viking sailors preferred to hug the coastline they and their ships were capable of long ocean voyages. But life onboard was very physically demanding. The crew ate, lived and slept at their oar place. There was very little shelter in bad weather, though it is suggested by some historians that when anchored or beached, the sailors could have taken the sail from the mast and used it for cover. Food was very basic; the most common dish was porridge and this was varied with dried or salted fish. Opinions differ about whether or not the Vikings lit cooking fires on their ships. The inherent danger in doing so would present a great risk. Hence, whenever possible, the sailors would pull into the coast at night so that they could light cooking fires on the beach. When the time came to raid a shore settlement, the shallow draft of the vessels allowed the captain to bring his ship very close inshore or even beach it. The sailors would then grab their weapons and wade ashore, often with the element of surprise on their side, and transform from seamen into warriors. But who were the Vikings? Unfortunately, these men did not leave any written record of their lives or adventures. All the accounts we have of them are written by those who suffered at their hands or who wanted to try convert them to Christianity. It seems certain that although there were some trained warriors in their number, many of the Vikings were ordinary men, mainly farmers, who took time off from their normal lives to “go a viking”. Once he had the raw iron, the blacksmith then hand produced every nail for the ship, the tools for the shipwrights and also the weapons for the crew. By the use of double bellows the smith could keep a near constant air flow through the charcoal hearth.